Sig Sauer engineered the ROMEO 1 red dot sight to enhance your firearm's aiming capabilities.The 6-MOA red dot with multiple “click adjust” intensity settings ensures rapid target engagement under a wide range of lighting conditions. 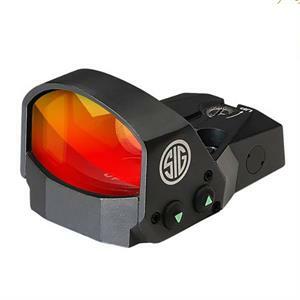 The molded aspherical lens is bright and distortion free so you will see your targets with clarity.The actual viewing area of the glass lens is 1.125” wide and 0.700” tall. The adjustable brightness and Motion-Activated Illumination System (MOTAC) powers up when it senses motion and powers down when it does not. Manual brightness controls remember your last setting after powering off. It is powered by a top-loading battery so you never have to lose your zero. The Romeo1 is CNC-machined from a solid billet of Magnesium making the sight durable, lightweight, and waterproof. The TruHold twin-spring adjustment system is designed and endurance-tested to withstand handgun recoil, deliver lock-less zeroing performance, and to return to zero with impeccable repeatability.